Just to press on with the Daily Mail vendetta for a tad longer, the superb Will Tooke has caught the ‘newspaper’ in another piece of fakery. 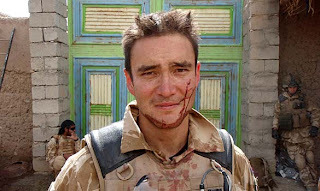 This time, taking liberties with James McKie, the war hero who threw a grenade back at the Taliban. 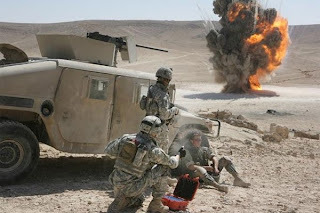 I saw the grenade come over hit Captain Kerr on the back of his body armour and land between me and him, about a foot away from me, right next to him. Instinctively, Captain Kerr dived, tried to get away from the grenade, but there wasn’t a lot of room. He ended up on top of me, away from the grenade. When I saw the grenade there, I thought, I hope it doesn’t hurt too much. 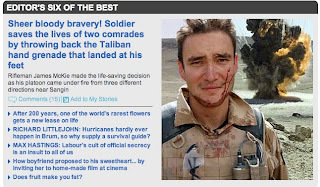 The problem was, the [only] picture was taken when all the action was over, and it seems [it] just wasn’t dramatic enough for the Daily Mail to match the story of intense bravery. If only there was a picture of Rifleman McKie doing the sort of high octane daring do you see in war movies, you know, like that film The Hurt Locker that just won a load of Oscars. Gosh, that would be perfect. Journalism – it’s easy. If you’re shameless. This entry was posted in Influence and networks, UK and tagged daily mail, james mckie, lies, will tooke by David Steven. Bookmark the permalink.